Actors and actresses treading the boards at Nottingham's Lace Market Theatre can relax in fresh new surroundings thanks to the generosity of store staff. 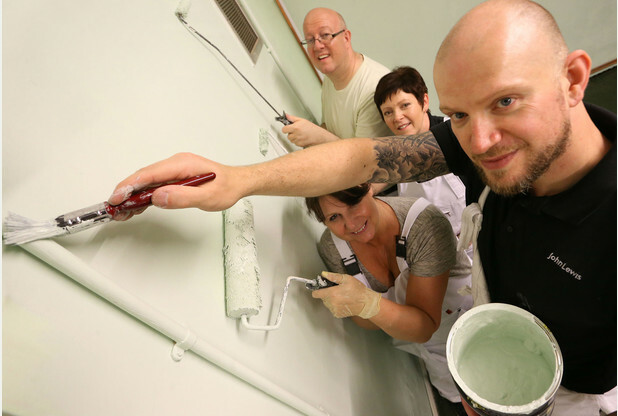 Four employees from the John Lewis department store, in the Victoria Centre, donned overalls and set to work to give the green room at the historic venue a lick of paint. The staff's selfless efforts coincide with the Nottingham Post's Good Deeds Notts campaign, which encourages 1,000 people to do an act of kindness over the next 12 months. Their hard work came after Jim Brooks, a stock management partner at John Lewis, who is also an artistic director and actor with the theatre, mentioned at work that some areas of the theatre needed a spruce-up. The theatre, which is based in an 18th century former lace factory in Halifax Place, is run by volunteers, so all help was welcome. Mr Brooks, 52, of Mapperley, whose role at the theatre includes choosing up-and-coming productions, said: "The room was a bit of a mess and hadn't been touched for about five years. This project was kind of two worlds coming together - work and pleasure. I chose the colour - I think it's looking very fresh." Louise Law, community liaison co-ordinator at John Lewis, grabbed a paintbrush to help out. She said: "We like to support anything our staff or partners are passionate about. Jim is very involved in the Lace Market Theatre. He came to see me a couple of months ago and said he had a little project he wanted some support with." She said she was pleased with the job the staff had done, having started painting the 30 square-metre room at 8.30am yesterday and finished around 4.30pm. Ms Law, who lives in the Peak District, praised our campaign, saying: "A campaign like this is really good for raising awareness of smaller charitable and community groups and it's win-win all round, utilising partner's skills and staff's passions. People can see that even big corporations can get involved, and it doesn't have to be a massive project." Radcliffe-on-Trent resident Josie Gee, who is 57 today and works as a visual merchandiser for John Lewis, said: "My daughter, Alice Gee, who's 22, is a new member at the theatre and I thought I would put my name down and help freshen up the green room." Andy Jones, a project manager at the store, who lives in Mapperley, said: "It's nice to give back to the community." The 38-year-old supports our Good Deeds campaign. He said: "It's totally brilliant. It was nice to know we were doing something good. The theatre is mainly run by volunteers - how else do they get stuff done if there are no volunteers?" The theatre, which was taken on by trustees in 1972, has nearly 400 members, ranging from actors to lighting technicians to audience members. The venue, which has 168 seats across two auditoriums is closed throughout August while a programme of improvements is carried out, including rewiring. The theatre runs 14 shows each year, including a youth theatre show, with forthcoming productions including Noel Coward's Present Laughter, A Midsummer Night's Dream and A Woman Of No Importance.